Anne-Marie is a Lecturer in Education (Childhood Studies), and joined the School of Education in 2011. 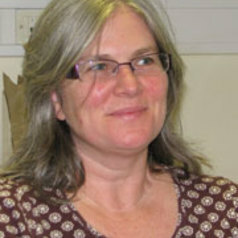 After a first career in language teaching, she returned to Higher Education to study for a Master’s degree at the University of Liverpool’s Institute of Latin American Studies, where she also completed her PhD in 2005 ‘Translating Rights: Childhoods and the Convention on the Rights of the Child in Oaxaca City, Mexico’. Marie worked in the field of Development Education, leading a participatory project with young people in school councils and the Schools Parliament in Liverpool. Children’s voices, rights and agency; Sociological and cultural understandings of childhood and youth; Gender and identity; the use of transformative methodologies such as stories, autoethnography, narratives and poetic inquiry. She is currently developing new research around pedagogy, practice and reflection in Childhood Studies, and the benefits of creative writing for health and well-being with young people (poetry/bibliotherapy).